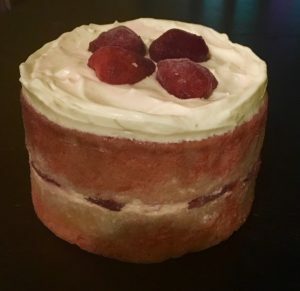 Posted on May 12, 2018 Posted in Cakes	. If you visit my blog frequently you will recall I went on a baking journey of 15 recipes from the Australian Green & Gold cookery book published by New Holland, in which features 100’s and 100’s of traditional Australian recipes from ‘experienced housewife’s and cookery experts’. 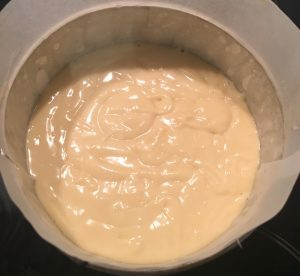 From the 15 recipes I made 3 were key standouts that I couldn’t ignore and had to add to my Aussie traditional section on this blog. Following the Bread Fritters and the Sago Plum Boiled Pudding my final favorite was the Strawberry Soaked Sponge Cake. 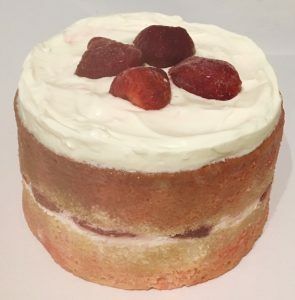 Think sponge cake with strawberries and cream…yes it’s sounds quite standard and nothing special…however, what about if I mention…the whole cake is soaked in strawberry jelly?! I’ve made cake with jelly crystals before but never poured jelly over a cake like you would a syrup cake. I did slightly tweak the volume of some ingredients to appeal further to the current palate, but only little tweaks here and there. 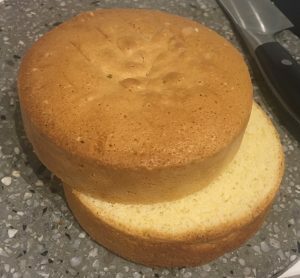 This cake is a delicious sponge cake with an Aussie traditional old school twist. Line a 25cm cake tin with baking paper and pre heat the oven to 180c degrees. Place the butter, vanilla and sugar into a bowl and whisk using electric beaters for 3 minutes or until thick, pale and creamy. Add eggs, beating in between each addition for 15 minutes in total. Sieve the flour, cream of tartar and bi carb of soda into a bowl them add the flour mix into the egg mix. Beat the mix until the flour is only just combine and there are no lumps. Pour the mix into the prepared tin and bake in the oven for 45 -50 minutes or until a skewer inserted in the centre comes out clean. After 5 minutes cooling in the tin invert the cake on a cooling rack until cold. Using electric beaters whisk the cream and icing sugar until stiff peaks form. Wash and dry the cake tin used for the sponge cake, spray with oil spray and line the tin with 2 pieces of plastic wrap allowing for lengthily overlap. Make the strawberry jelly by placing the crystals in a bowl with 400ml boiling water and stir. When crystals are dissolved add the remaining 300ml cold water and leave the jelly aside to hit room temperature. Meanwhile, cut the cake in half horizontally and place the bottom cake layer in the lined tin, cut side up. Cover the top of the cake layer in the tin with 100g of the thickened cream. 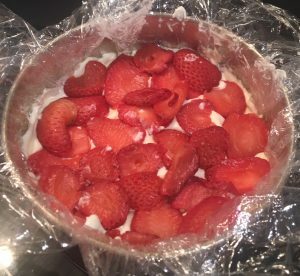 Cut 160g of the strawberries into slices and scatter evenly on top of the cream. Top the strawberries with an additional 100g of thickened cream then place the second cake layer, cut side down onto the cream layer. Push the cake a little with your hands to ensure even consistency of cream and no air bubbles. 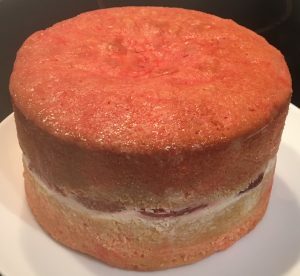 When the jelly is cooled pour half the mix over the top of the cake slowly, ensuring even coverage, allowing for the jelly to soak into the sponge before pouring further. Leave the jelly aside for later use. Pull the overlapped plastic wrap over the top of the cake and place the tin in the fridge to set for 2 hours. Following, pull the plastic wrap up to release the cake from the tin. 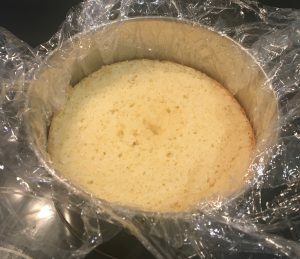 Turn the cake carefully upside-down on the plastic wrap and gently place back into the tin. Pour the now top (previously bottom) of the cake with the remaining jelly mix and cover the cake again with the overlapping plastic wrap. 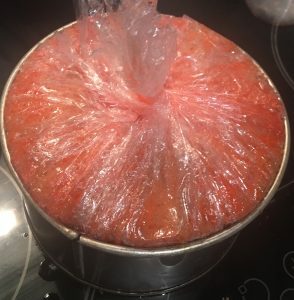 Place the cake in the fridge for 2 hours to set. To finish the cake, remove it from the tin by pulling up the plastic wrap and place the cake onto a plate. Spread the remaining 50g of whipped cream over the top of the cake and decorate with the remaining 40g of strawberries. 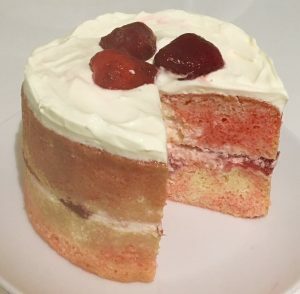 Tags: cream, jello, jelly, soak cake, soaked, strawberries and cream, strawberry, strawberry jelly, Strawberry Jelly Soaked Vanilla Cake, vanilla cake	.